My family and I went for a Sunday outing to Mt French yesterday. It sits tucked away from Boonah shopping area. Much to my surprise, the road going in to and out of Mt French National Park was a winding road. However, the bush land scenery was peaceful and inviting. As we arrived in the park, I found the parking to be a little less than what I expected from a Nation Park but served the purpose. Those that want to camp there park their cars in the parking area and then carries their camping equipment to their destination. There are a few tables and bbqs to cook and eat on. There is also a mens and womens bathroom. I did not find a shower there. The camping fees are set up in a honour payment. Which means that you stop at the camping board, get a envelop and card, write your name on the back of your card and then when you leave you put the card and the money for the amount of time you stayed into the envelop and slide it into a make shift box. There are two tracks that you can walk to see all the surrounding mountains and the East Over Look. We decided to take a leisurely walk around the camping areas to see how they had them laid out. We found they are different sizes. They are boxed off with small logs for the frame. That is your area to put your tent and belongings in. We continued walking up an old road which looked to me like a logging road. The tracks were old but lead up to several bush walking tracks. So, we chose a track to walk and soon found that the cliffs and road area that I had just previously read on the information board was were we were standing and looking out. It is known as a spiritual place. No one was allowed to climb these cliffs for that reason. Between 1917-1920 on the board they also had picnics in the same area. We had found the back side of the 850 m walk and was heading toward the camping area. We then walked out to the East Over Look to see the beautiful views of Boonah's farming area. Though heights do bother me, I wanted to see the sights with my family. My husband and I then took a track many don't take, it stretch along side of the mountain and in some places it was narrow. But the views are wonderful, especially if you want to get back out into the bush land. It is a nice day spot, and we saw a lot of people who had been camping there and were still. 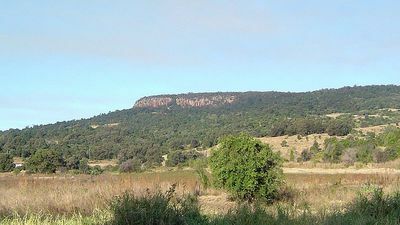 The area is known for Black Cockatoos, rock wallabies and a day time owl that is going extinct and also bearded dragons. We seemed to find a butcher bird of some sort that was black and grey but very beautiful. The feeling you get at Mt French is that of peace and tranquillity. I would suggest if you like bush walking and just being at ease then this would be the perfect day trip to take. Why? The bush land scenery was peaceful and inviting.